White cake topped with a combination of chopped nuts and dried fruits in its filling, topped with a meringue icing. Bananas, pinapple and pecans in a light cake, topped with a cream cheese frosting. 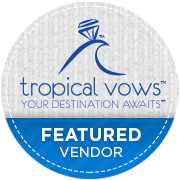 Copyright © 2016 Weddings The Island Way. All rights reserved. Website byTech Diva Media. Please drop us a note with any questions or requests you have about island weddings on St. Thomas or St. John and we'll get back to you, asap. Thank you!